My type of vacation is not all beer and skittles. Sometimes it’s downright anxiety provoking, especially when it comes to transportation issues. 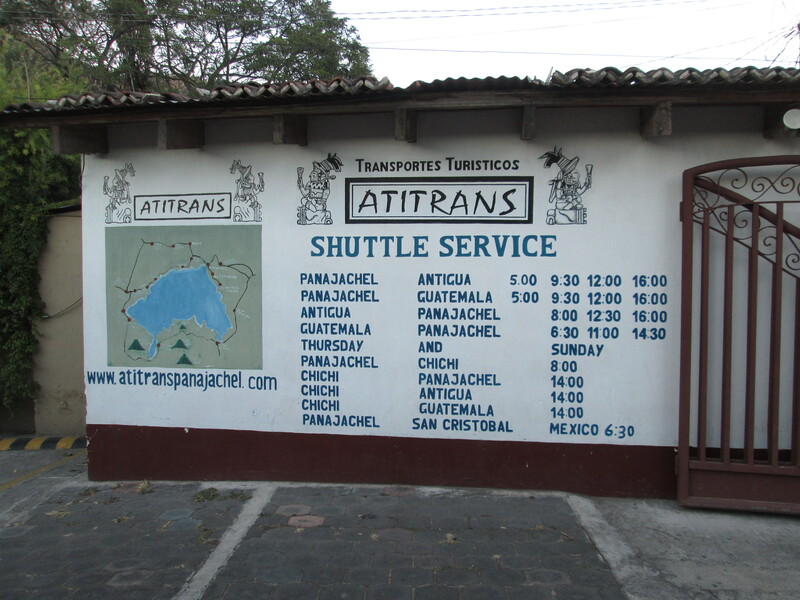 I wanted very much to see the market at Chichicastenango, but the ATITrans shuttle from Panajachel left only at 8:00 AM on Thursdays and Sundays. 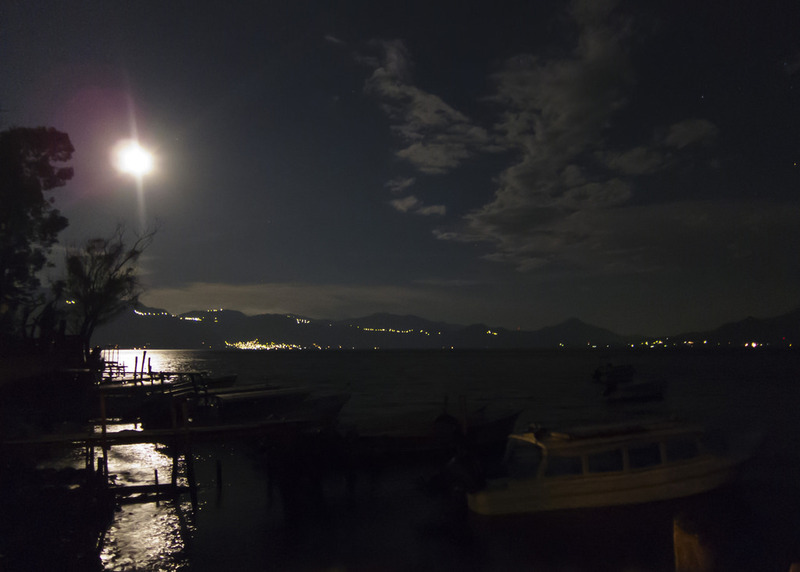 But I was staying at Santiago Atitlán, which is connected to Pana pretty much only via boat. (There is a road, but it is susceptible to hijacking.) I got sweats in the middle of the night worrying about whether I could make the connection. So I arranged at the Posada de Santiago for a launch to pick me up at the hotel’s private dock at 6:00 AM, which gave me two hours to get to the ATITrans office via fast launch and tuk-tuk. The hotel assured me that the deal was done, for a mere 250 quetzales (roughly $32.00). At 5:15 AM, without my breakfast (the restaurant opened at 7:00 AM), I wended my way in the dark down the trail to the dock, which was fortunately well lit. At six sharp, I heard the launch and saw the headlights growing larger. They were right on time. We headed out before sunrise at high speed. It seemed we spent as much time in the air as on the surface of the lake. It was my bad luck that all four launch rides on the lake were on windy days with many whitecaps in evidence. But we made it to the public dock in Pana in three quarters of an hour. Fortunately, the tuk-tuks were already up and about, so I got to ATITrans with an hour to spare. Fortunately, there was a fresh orange juice vendor setting up right across Calle Santander from me, so I had something of a breakfast after all. And in the end, I got to Chichicastenango in good time. I have some heterodox beliefs regarding God and the gods. I believe that God exists but wears many masks, appearing as Jesus, Allah, the gods of the Hindu pantheon, depending on the different types peoples around the Earth. 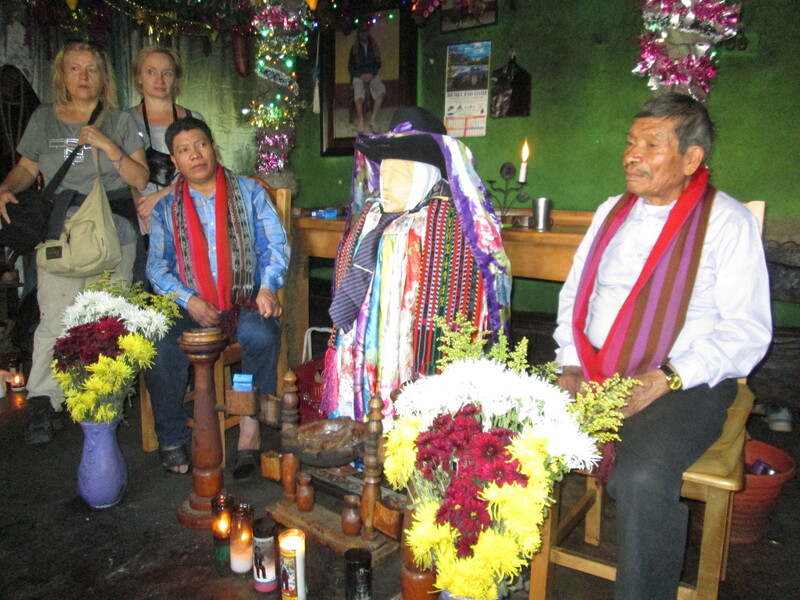 I visited two Maya idols during my trip: Maximón in Santiago Atitlan and Pascual Abaj in Chichicastenango. I have written earlier about my intent to visit Maximón, in whose person are incorporated such figures as Judas Iscariot and the evil conquistador Pedro de Alvarado. He is a Tzu’utujil Maya god of good and evil. 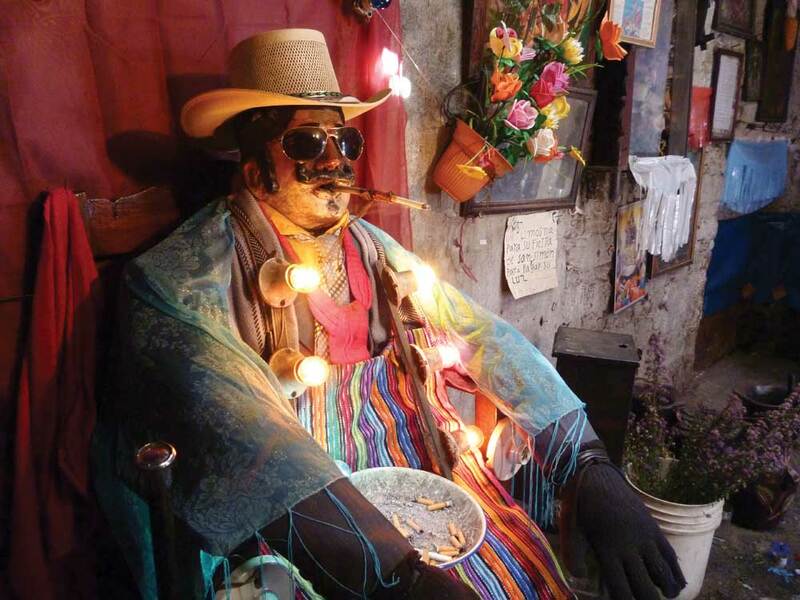 During the day, a cigarette or cigar is kept burning between the idol’s lips, and he frequently imbibes rum or aguardiente (very high octane firewater). There is a brotherhood (cofradía) dedicated to taking care of the image of Maximón. Each year he occupies a different house belonging to one of the brotherhood. I made an offering to the god, which was accepted by the cofradía and attached under the knot of his necktie as shown in the above picture. I asked him to aid me in the remainder of my trip to Guatemala and Honduras. 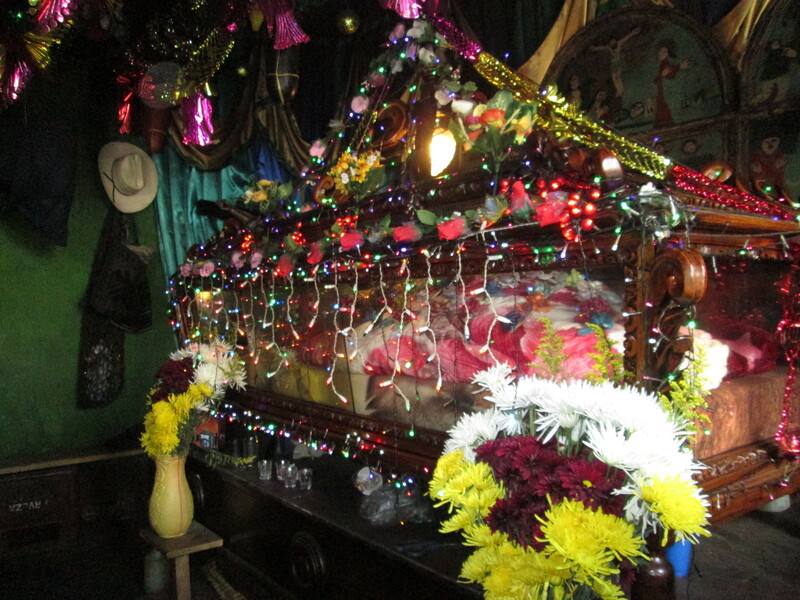 Next to Maximón was a glass coffin containing an idol to Santa Cruz, who is in some unspecified way associated with Maximón. From Santiago Atitlán, I traveled to Chichicastenango in the mountains. There, with he help of a guide, I climbed a hill to the shrine of Pascual Ab’aj. What remains after members of Catholic Action damaged the idol in the 1950s is a dark featureless rock, probably of volcanic origin. I had a difficult time climbing the trail, which contains over twenty switchbacks. Fortunately, my Quiché Maya guide Juan took a knife and made a staff for me. 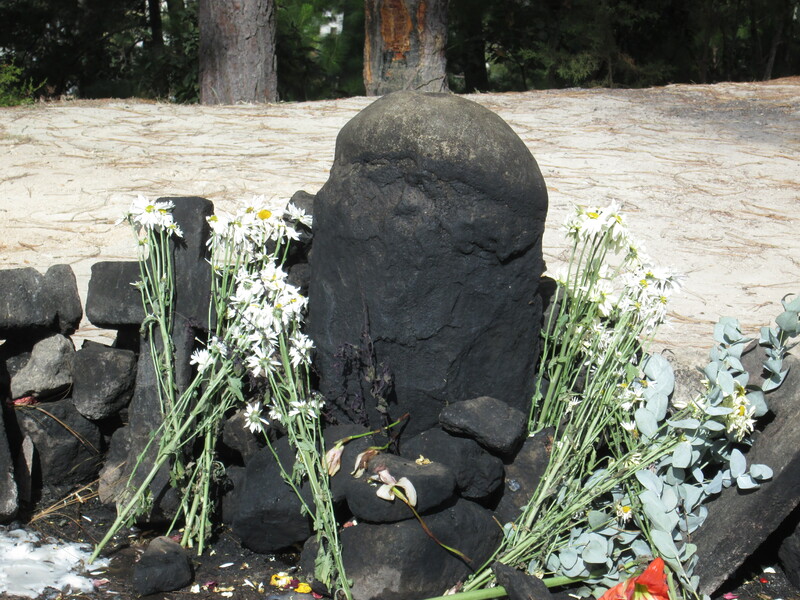 There were numerous cement bases where copal incense had been burned. At the time Juan and I visited the shrine, there were no celebrants or members of the cofradía in evidence. I laugh when ignorant people wonder what happened to the Maya. They are still around, and still occupying the parts of Mexico (Chiapas and Yucatán), Guatemala, Belize, and Honduras that constituted the original Maya homeland at its height. There are millions of Maya around. They speak some thirty different major dialects of the Mayan language, most of which are not understandable to Maya speaking other dialects. When Cortés arrived in 1519, he made short work of the Aztecs. Moctezuma and his people were conquered within a few years. (Their language, Nahuatl, still exists.) It took a considerable while longer for all the Maya polities to fall. The last one, Tayasal, located on the Lago de Petén near present-day Flores in Guatemala, fell in 1695. But the Maya are still Maya. They managed to survive with their culture not quite intact, yet robust enough to survive under new circumstances, namely Spanish conquest. There are still isolated Maya villages where non-Maya are not welcome. In others, there are strange new Maya gods, such as Maximón (mah-shi-MOAN) whose image appears above. When I visit Santiago Atitlán, I plan to visit him and offer a gift, typically a bottle of aguardiente, cigars, or a pack of cigarettes. 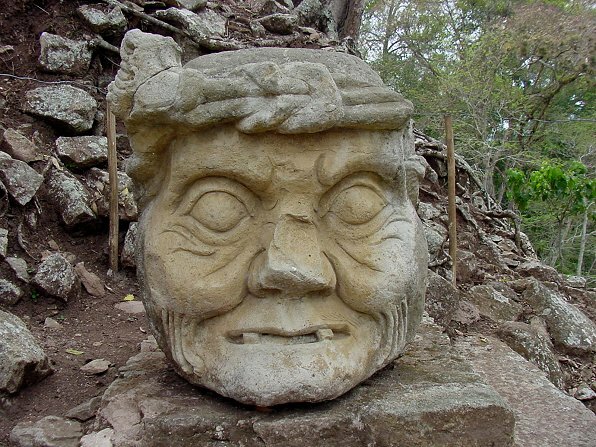 In Santiago Atitlán, Maximón is the god of destructive nature, of floods, earthquakes, and storms. A traveler and walker, he is associated with snakebites, is the inflicter of madness, and is worshiped at the mouths of caves. [Anthropologist] Michael Coe associates Maam (Maximón) with the Yucatec god Pauhatun, also known as God N, one of the most powerful underworld gods. In fact, Pauhatun is the quadripartite god taking part in a hallucinogenic enema-ritual depicted on the funerary vase in Michael Coe’s Lords of the Underworld…. It was strange, therefore, to see atitecos [Maya residents of Santiago Atitlán] treating Maximón with such tender reverence, but I knew that this merely reflected the different concepts of evil held by ourselves and the Maya. Among the attributes worshiped in Maximón are those of Judas Iscariot and Pedro de Alvarado, cruelest of conquistadores. I cannot help but think that there is something in the Maya conception of evil that has led them to survive as a culture—if not 100% intact, then at least substantially intact. Compare that with America’s vision of itself as “a city on a hill” acting as a beacon for all peoples, while we slaughter our own children with military automatic weapons.